When I was contemplating setting up a writing group, I Googled ‘’Creative writing as an aid to recovery’’ and was amazed by the response I got. It wasn’t just the numbers, which were phenomenal, but the diversity of their origins. There were articles by highly respected journalists from all the broadsheets, papers by university professors, personal accounts from inmates in prisons and patients in hospitals as well as many more from ordinary working people who raved about the benefits of writing purely for the pleasure of it. Doctors and psychiatrists wrote about patients who initially reported suffering from depression, but improved greatly once they were encouraged to write down their thoughts and feelings on paper. A long time ago, when I was battling with my own demons, I tried this and the mere act of pouring my problems out through a ball point pen on to a blank piece of paper was better than all the medication that was being prescribed at the time. I had always wanted to write, but couldn’t find a purpose and when the doubts set in I figured it was just a pipe dream, like wanting to play football like George Best or Bobby Charlton. I dreamed of scoring the winning goal at Wembley and then soaking up that roar of applause. I realised that was never going to happen especially as I had never owned a pair of football boots in my life. But writing was different. Yes it was hard, but as the saying goes, when the going gets tough, the tough start writing. I used to think I needed a university education if I was to be a writer, but after many wasted years floundering around in no particular direction, the internet came along and I learned how to use search engines. There was so much advice from all the greats like Ernest Hemingway to JK Rowling. I read countless short stories and felt more at home with this form. But I still wasn’t a writer. I wrote long, rambling emails to friends overseas and that was the extent of it. Then retirement crept up on me and I had to find a way to pass the time. I looked for a writing group but none appealed to me. And then, like a bolt of lightning, it hit me. Why not start my own writing group where people like me could gather and explore whatever little creativity we had. Piece of cake, I thought. Well, not exactly. 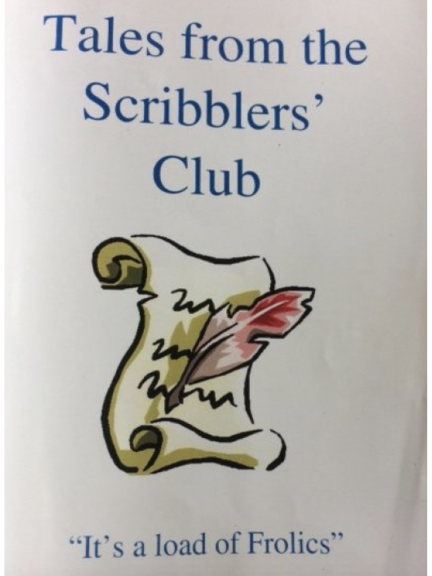 But it was at that moment the Scribblers’ Club was born.